Atomic Sketch is a monthly live-art event which takes place the last Thursday of every month. We feature a panel of different artist every month who make art at the event and hang it on our walls to sell at extraordinarily low prices. In addition, drop-in artists are always welcome, but space is limited. Atomic Sketch was conceived back in May of 2005 when art lover Dominic Cesario and artist Brian Hofmeister were visiting San Francisco and attended Sketch Tuesday at 111 Minna Gallery. We loved our experience and realized nothing like it existed in Chicago. 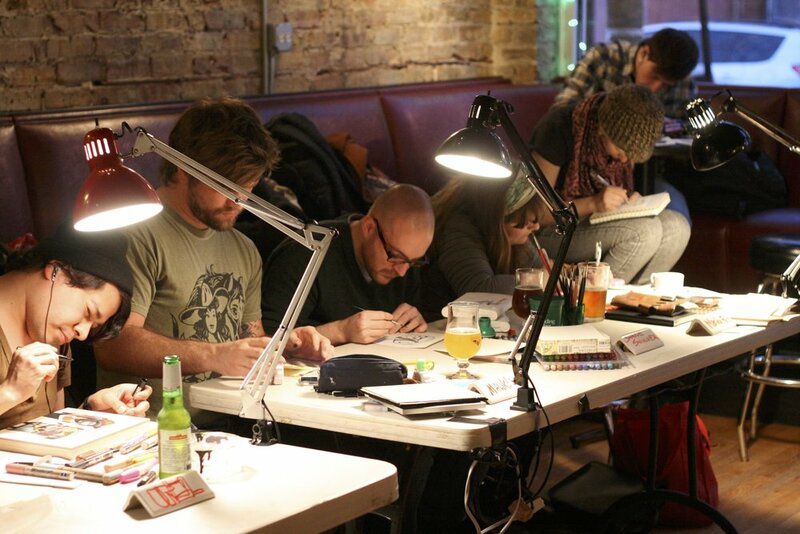 Within 2 months, and with the help of our third founder Charles Joly, we brought Chicago its first monthly drink and draw style event that really focused on connection burgeoning art collectors with Chicago's emerging artists. Our first home was The Evil Olive in Wicker Park and we stayed there for several years, until we moved to our current home, The Green Eye Lounge. In the earliest days, we had a lot of help from artist Michael Frank, who designed our original logo and really helped in recruiting our initial stable of panelists, despite living on the west coast. Back then, we recruited through craigslist and MySpace. Yes, we are old-school! Over the years, we've benefitted from help from a number of other individuals. Our first resident DJ was Greg Haus back when we were at Evil Olive. Later, through a partnership through Chirp Radio, we had a rotation of DJs each month. We were joined by Rick Harris, who was our webmaster and artist wrangler for several years. Artist and animator Greg Browe joined us briefly as our social media guru, until he moved out West. We've partnered with some amazing institutions, including Ript Apparel, AG47 and Challenger's Comics, Dimo's Pizza and the Intuit Center for Outsider Art. Today, in it's 9th year, Atomic Sketch continues to support the artists of Chicago by fostering community and providing exposure for artist at ever stage of their career. We have been there when a closet artist finally has gained the courage to show the world the doodles they've been doing behind closed doors, and we've seen the confidence gained from their first sale, however small. And we have been there when professional artists come because it's fun to just hang out, drink and socialize with other artists, share techniques and make connections. We've also been there when someone buys their first piece of original art, and they can't wait to take it to be framed, and start the plan of buying a larger piece, often by the same artist, for their new "collection."